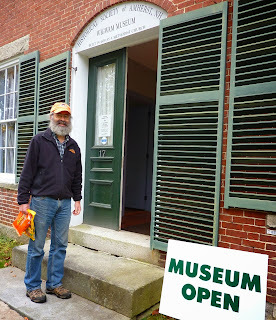 are located on Middle Street in Amherst Village and are full of interesting artifacts, pictures, paintings and other pertinent historical items. Stop in for a visit and learn a little about your town. This may inspire you to return to learn a lot! Both museums, located within walking distance of one another, are open on the Second Saturday of each month from May through October from 1 to 4 pm. They're also open and accommodate large groups of citizens during the July 4th celebration and during Antiques on the Green in September. What's that you say? You're not available during those times? 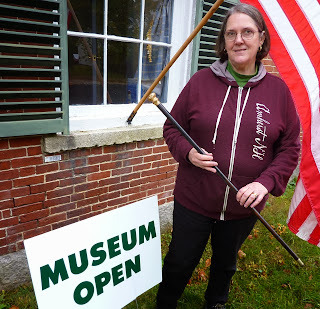 No problem, curators Susan Fischer and Chris Marshall, with some advanced notice, can arrange for your group to step back in time and and learn of your past when it is convenient. 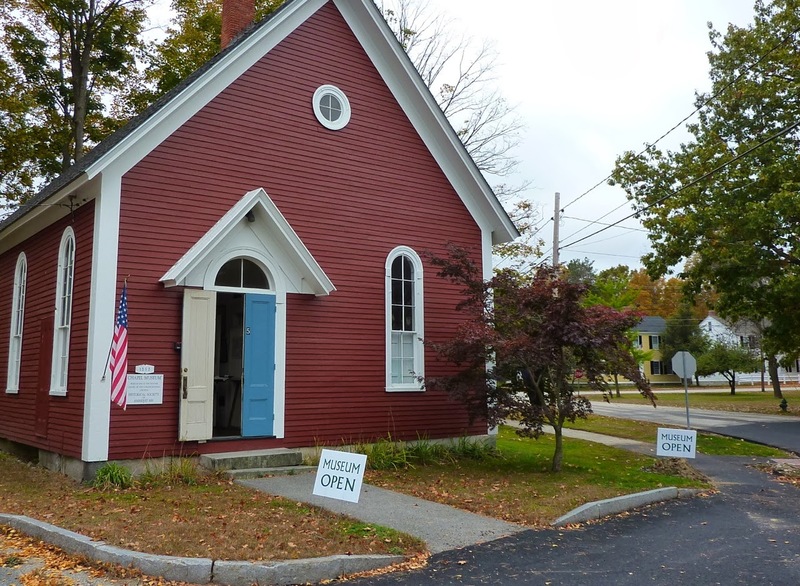 The Chapel Museum, built in 1858, is located at the corner of Middle and Church Streets in Amherst Village. It's primary function was to serve the Congregational Church during the winter months, but as well has seen duty as a school room as late as the 1950's while the Clark School was being built. Curator Susan Fischer and friends repairing the dehumidifier that helps protect the collections. For those of us who are fortunate enough to be an alumni of a one or two room schoolhouse, you'll feel right at home as you enter the Chapel Museum. The high ceilings, creaking floors, tall windows and even the familiar, musty aroma will return you to an earlier time. Maps, photography, paintings, scrap books, post cards, written records and Civil War artifacts can be found here. 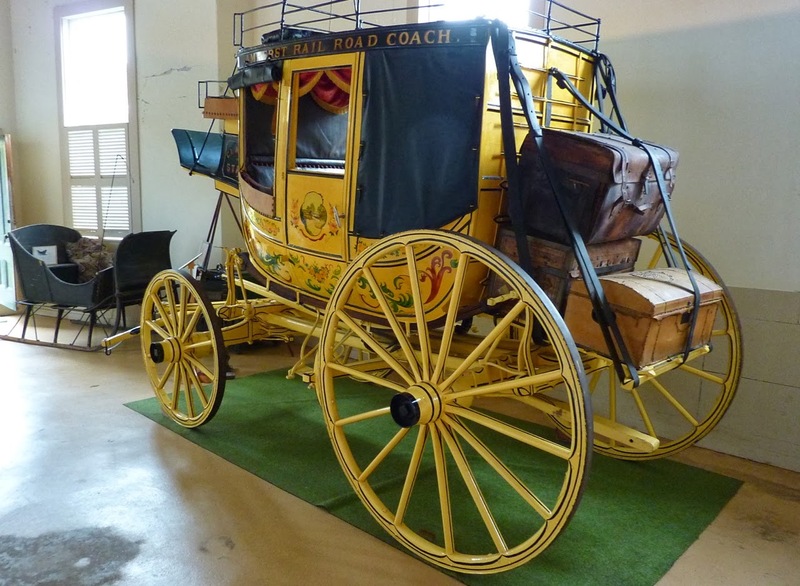 You've heard of Amherst's buggy whip factory? 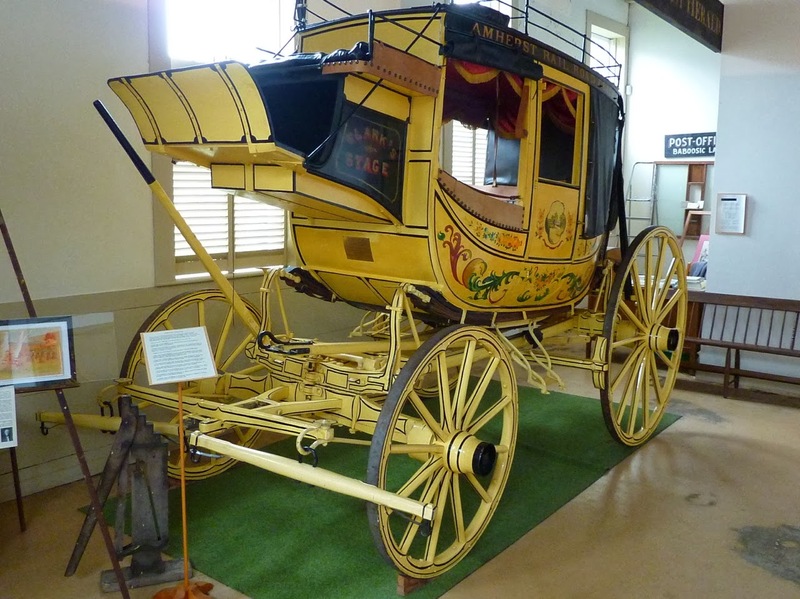 With a staff of 18 in 1832, they were among the towns largest employers and you can see one of their whips here. 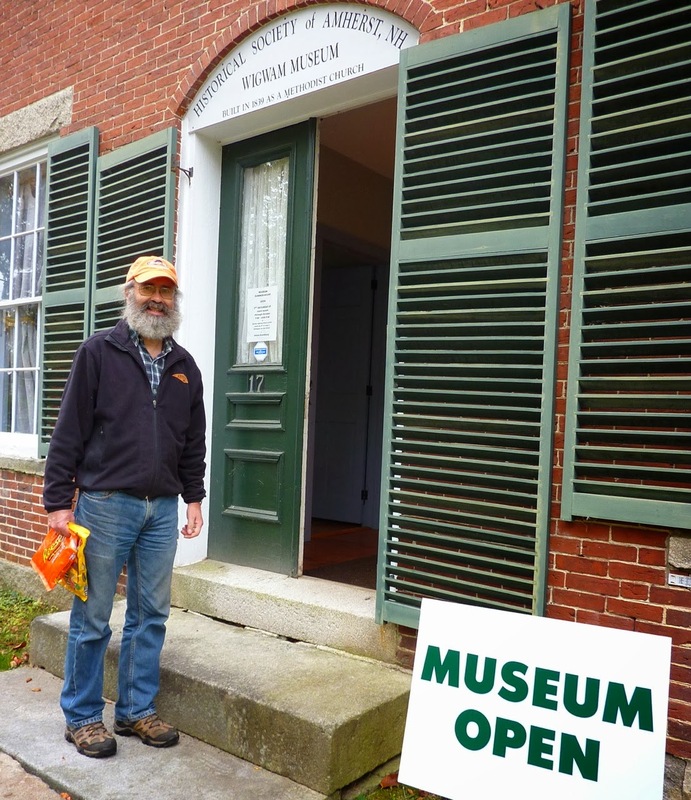 Curator Chris Marshall, at the entrance to the Wigwam Museum on Middle Street. Chris is preparing for the nearly one thousand trick-or-treaters that will visit during Halloween. But why do they call it the Wigwam? A new, much steeper roof line was created during the renovation of 1879, causing local citizens to designate it as "The Wigwam." Of course! 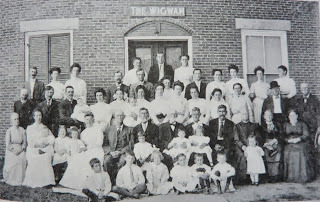 Taken at the same spot where Chris is standing above, you can see in this 1920 photo that they even painted a sign identifying it as the Wigwam. 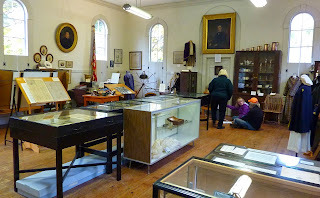 A little larger look at the museum that was constructed in 1839 as the Methodist Church. 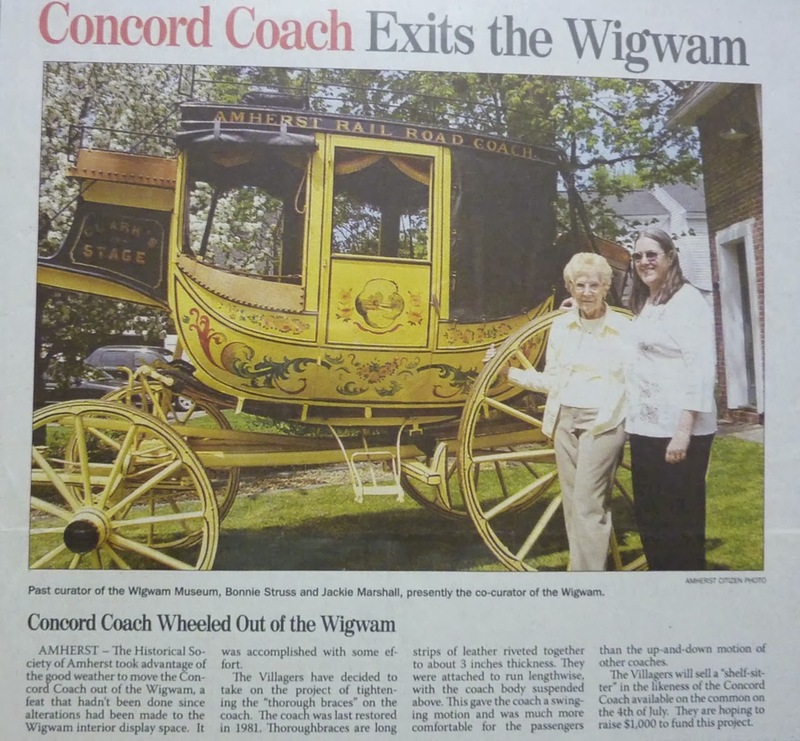 Our Concord Coach and Abbot-Downing of Concord, New Hampshire have fascinating histories. Some of those facts concerning our coach are listed below. But the best way to learn about this unique treasure is to stop by the Wigwam for a visit. Built in 1849 and acquired by the Historical Society of Amherst, NH 119 years later in 1968. 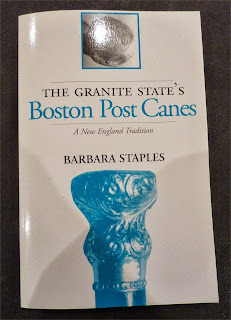 Jackie Marshall holding The Boston Post Cane, another example of a Wigwam treasure. 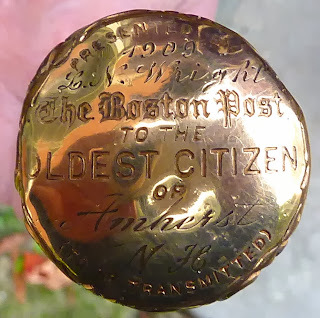 In 1909, Boston Post editor Edwin Grozier, dispatched 700 ebony and gold capped canes to the selectman of 700 towns in New England. They were to be issued to that towns oldest male citizen. Women were included by the mid 1930's though. The cane, that came to be known as THE BOSTON POST CANE, would be passed on to the next oldest citizen upon the previous holders death. Many towns still engage in this tradition, but numerous canes have been lost, stolen or destroyed. Interesting stories exist though about canes lost for decades that have re-surfaced in attics or returned by a purchaser, found at a flea market. Ours still exists, is on display at the Wigwam Museum and last issued to long time resident Gladys Pestana. Made by J.F. Fradley and Co of New York, they were constructed of African ebony and a 14-carat gold, engraved cap. Barbara Staples from Mass has written several books about the Boston Post Cane clearing up much misinformation. In fact, here's one of her books. She's written another concerning Massachusetts and plans two more about Maine and Rhode Island. 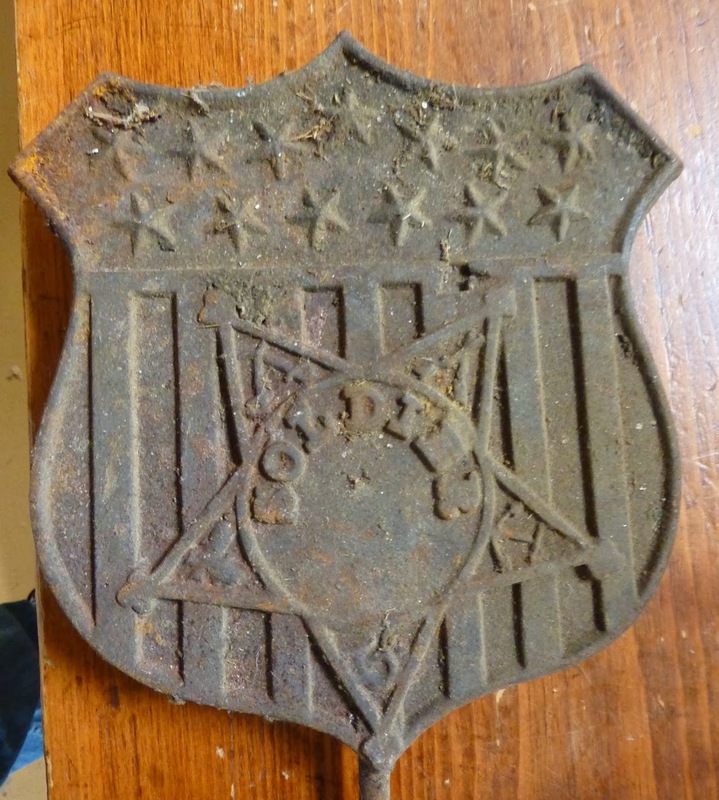 I have a particular interest in this relic as a former owner of our home, Charles "Tink" Pherson (1860-1951); blacksmith, wheelwright, coach maker and lumberman possessed it for many years. These are two of the many different veterans grave markers that have been used over the years. 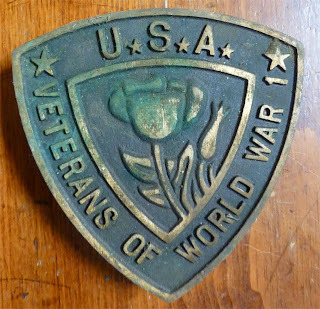 Not long ago Jackie Marshall and Marie Grella found a large cache of these markers in a town building, obscured deep beneath years of accumulation. They pulled on rubber gloves, dug them out and cleaned them before displaying them at the Wigwam. 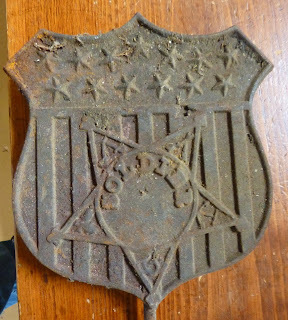 Reusing these antiques by placing them on local graves was considered, but pilferage of vintage items like these quickly dissuaded them. Taken in front of the Brick School c1912. Elna, row 2, 3rd from left. Allen row 3, 1st from left. 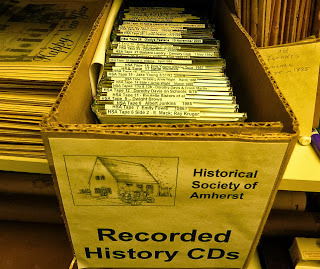 Another interesting site is the Archives room at the Amherst Town Library that's abundant with reference material. Of particular interest are the oral histories with prominent citizens that are available on CD's and tape. 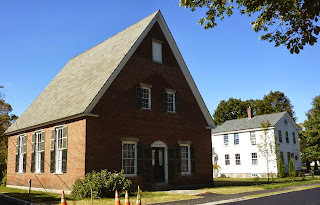 I recently listened to Elna (1902-1995) and Allen Howard (1902-1986) speak of village life before electricity and plumbing found their way to Amherst. We live in their home and have read and heard much about this colorful local couple, but could now put a voice with their pictures. 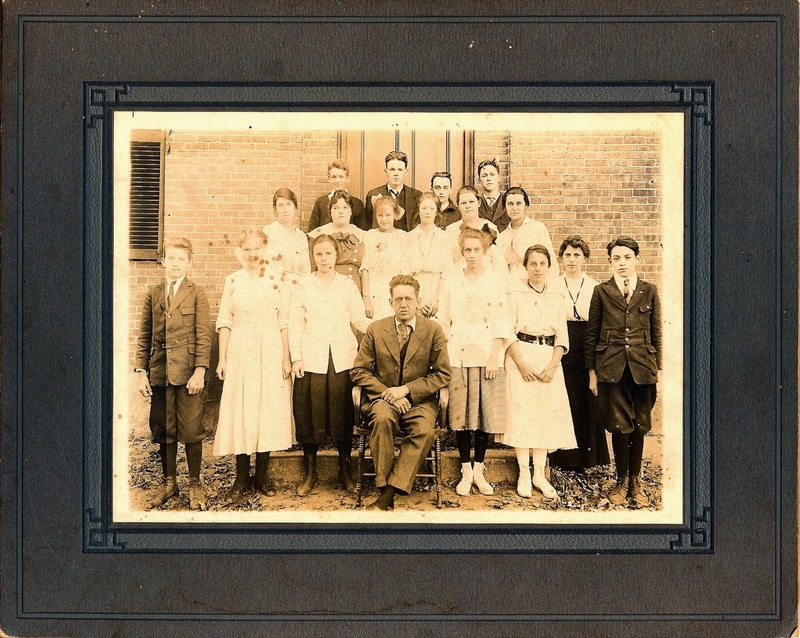 Can anyone shed light as to the other class members in this photograph? Just one of the many resources in the library's archives room maintained by the the Historical Society. 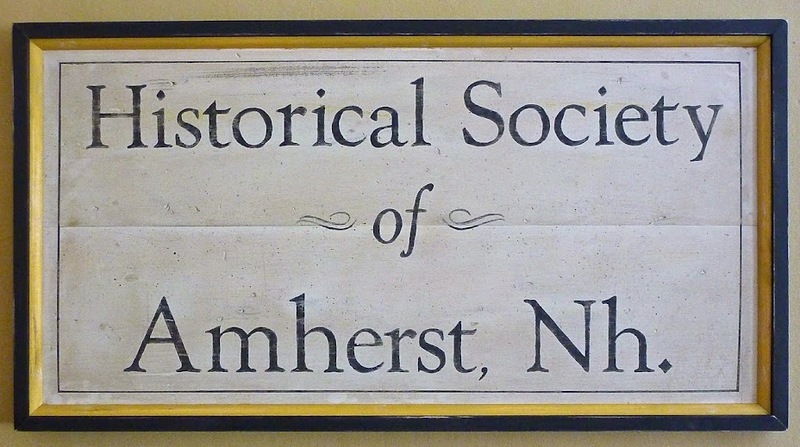 Would you like to join the Historical Society of Amherst, NH? It's simple. Click HERE to find our Home page and then click on MEMBERSHIP in the far left column. Do you have something that you'd like to share on this blogsite? 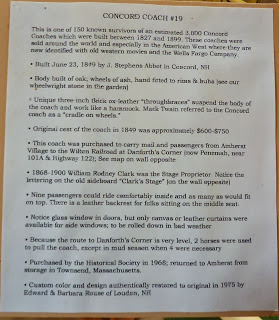 Author and historian Glenn Knoblock spoke to the members of the Historical Society of Amherst, NH on the evening of 7 October 2013, as the remnants of tropical storm Karen swept northward through the village. Guest speaker Glenn Knoblock and the Historical Society's Neil Benner in the Johnson Room at the Amherst town library. 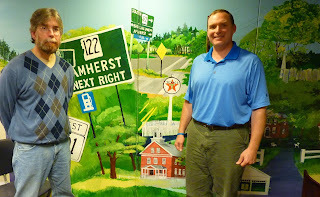 Glenn is a native Ohioan who migrated to New Hampshire in 1984. 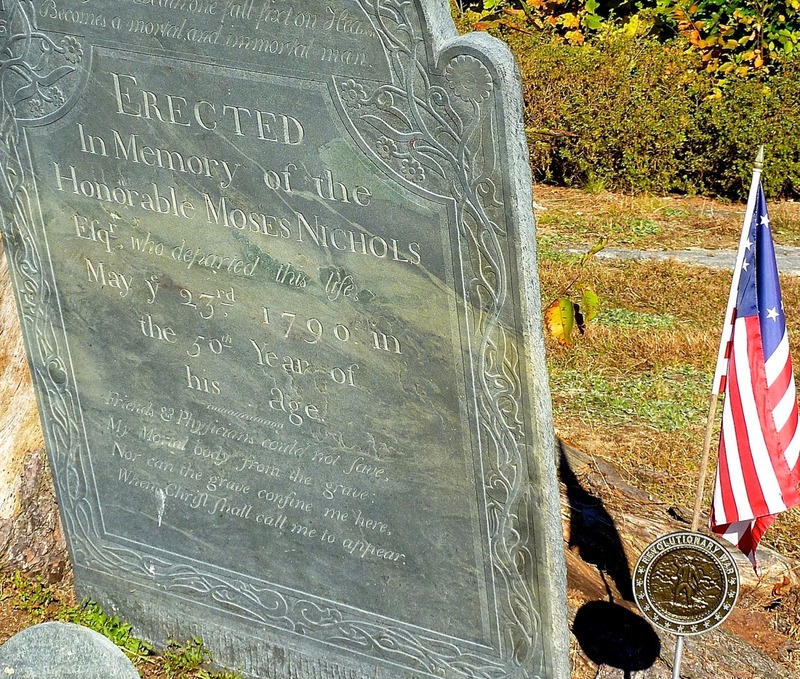 Armed with a BA in history from Bowling Green State University, he's a prolific author concentrating on New Hampshire history and military veterans who have received little or no recognition. 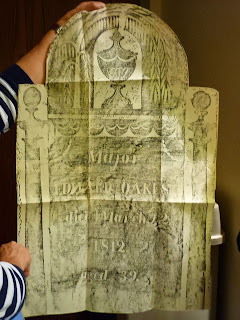 Tonight though, his topic was NH Cemeteries and Gravestones and spoke of the history that these "deeply personal works of art and the craftsman who created them represent." 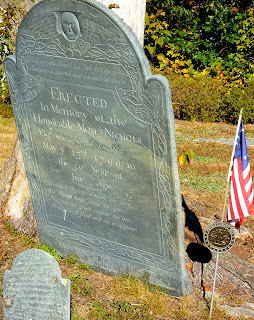 Each "stone page" tells a story and gives insight into the genealogical book of New Hampshire. 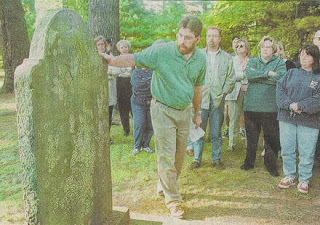 Through a slide presentation he told of how gravestones came about, spoke of their creators, the artwork, their locations and how they "move about" within a cemetery. As most things in life it's all about economics as to who could afford a $9 headstone in 1776 and that persons standing in the community as to where the gravesite was located with reference to the church building. 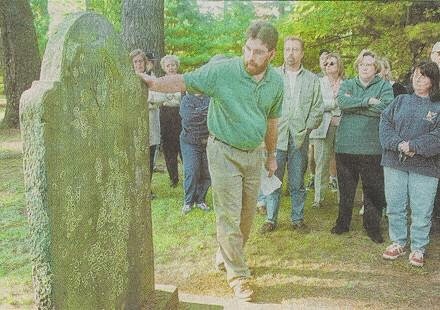 Glenn leading a tour and discussion in Hampton, NH. 3 October 2000. Photo: Steve Jusseaume, Hampton Union. 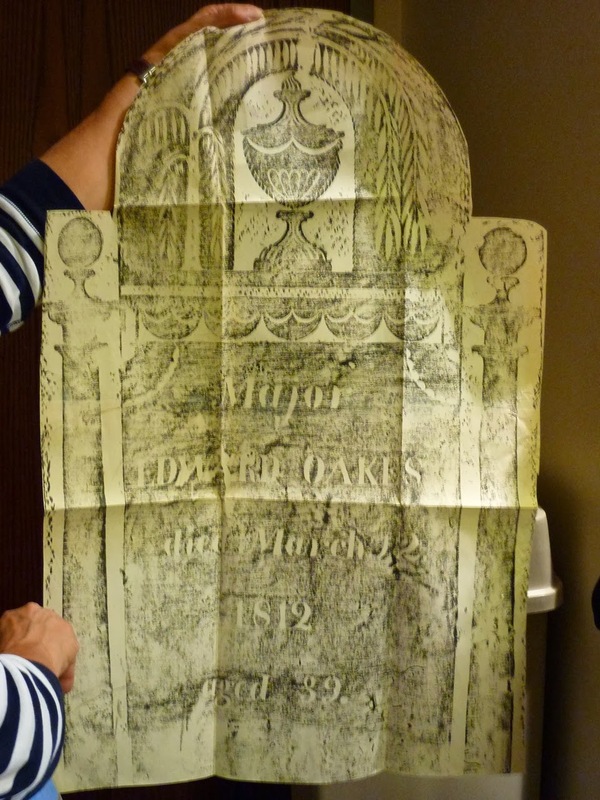 One of many in Glenn's collection, this is a rubbing of a stone belonging to Major Edward Oakes who died on 12 March 1812, aged - 39 years in Grafton, NH. 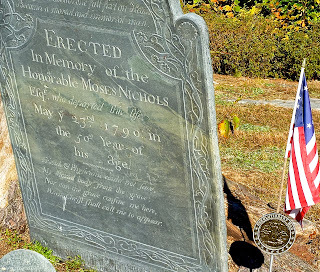 Note that this is a large stone for its time and the artwork is elaborate. It's unclear though as to whether "Major" is his first name or an Army rank. 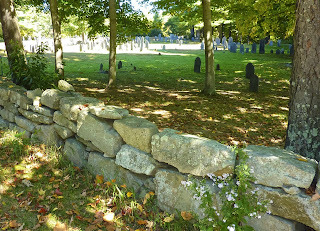 The Old Burying Ground, which dates from 1735 from behind the Amherst Town Hall, or third Hillsborough County Courthouse built in 1823. If you find that Glenn's presentation has spurred an interest in cemeteries and gravestones, you need not travel any further than our own village burial sites which have wonderful examples of the stones that he spoke of. 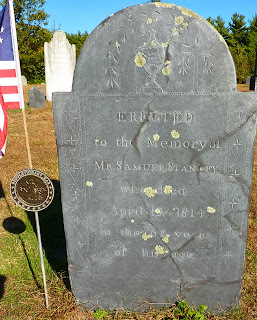 If you walk the graveyards, you'll notice flags and markers identifying veterans and the wars in which they fought. These are there through the efforts of Marie Grella and students from Souhegan High School who volunteered to step up. 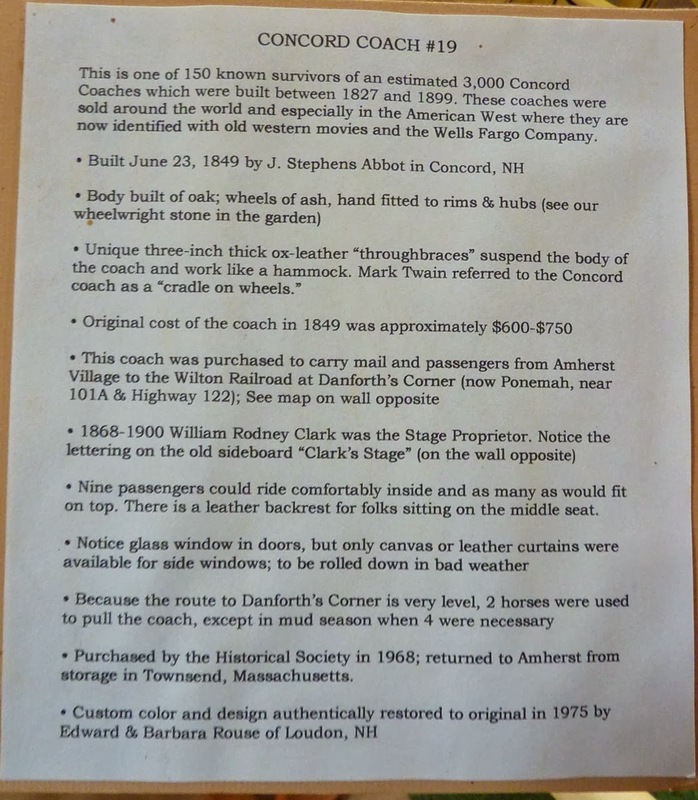 Glenn's presentation was made possible through a grant from the New Hampshire Humanities Council. Would you like to know more about Glenn and the books that he's written? Then click over to Amazon to learn of his vast interests and books that he has written. Our next meeting will take place at the Congregational Church on 9 December 2013 at 7:30 pm, where speaker Mike Pride will talk about "Our War, a new look at New Hampshire in the Civil War." These presentations are open to the public... we just hope that you join and support the society!